Alpha-actinin-1 (ACTN1) is a bundling protein belonging to the alpha-actinin family. ACTN1 is an F-actin cross-linking protein which is thought to anchor actin to a variety of intracellular structures. 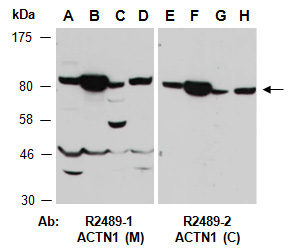 Rabbit polyclonal antibodies were produced by immunizing animals with GST-fusion proteins containing either the middle [ACTN1 (M) (R2489-1)] or the C-terminal [ACTN1 (C) (R2489-2)] region of human ACTN1. Antibodies were purified by affinity purification using immunogen. human ACTN1 at RT for 2 h.